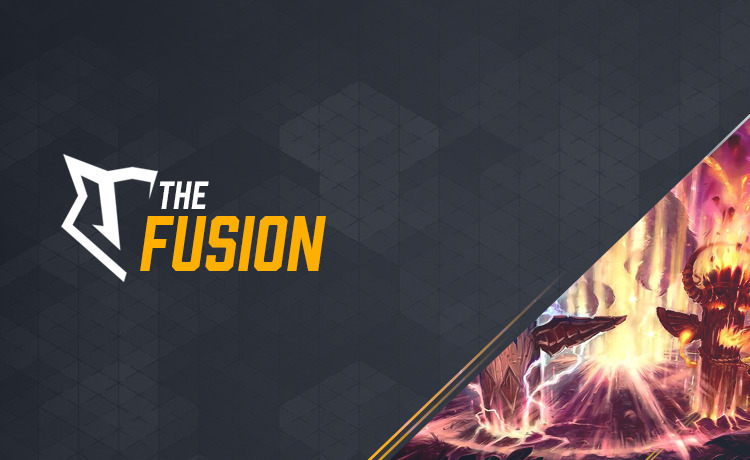 Fusion is a special ladder type which features specific card sets which are allowed to be used in addition to the basic and classic card sets. The card sets that are legal to use varies from week to week and will sometimes include wild sets as well so be sure to read up on the complete rules below. The prize pool is displayed with the Premium multiplier included*. The card sets which are allowed this week are: Basic, Classic, Witchwood, Boomsday & Rumble. You may mix cards from these sets as you wish when you build your decks for this ladder. You need to have played a minimum of 10 matches in this ladder to be eligible for rewards. Your starting deck must only be built out of the following card sets: Basic, Classic, Witchwood, Boomsday, Rumble. Adding a card to your starting deck from any other card set than the ones listed above will instantly disqualify you. You will shortly be matched with an opponent. Once you get a notification that your match is ready, add each other in the game and play with the given rules of the ladder. After the match is completed, report the outcome of the match and your “Ladder score” automatically starts to count. Track your progress in the “ladder” tab. Make sure to take ingame screenshots of all match results in case of a dispute or being requested by an admin. Picking a class which have been banned will result in a default win for the other player of that game unless the other player agrees to replay. If a player is disconnected the opponent can claim a win for that game after 3 minutes have passed, make sure to take a screenshot showing the timer. If there is a tie in ladder score an admin will decide whether a tie breaker will be played or if global ranking score will be the deciding factor. *The prize pool is displayed with the 3x premium multiplier included. You need to have an active premium membership by the time the ladder ends to receive the prizes as such. Non premium users will receive 1/3 of the displayed prize. Players who are participating in more than one ranked based ladder running simultaneously can only claim rewards in the one they initially started playing in. (eg: a player starting in the Bronze ladder climbing above the 200 global ranking score and then joining the Gold ladder can only claim rewards in the Bronze ladder). Being abusive by harassing or insulting other players in chat on Battleriff / ingame is not a tolerated behaviour and will result in loss of ladder points and ultimately getting banned. If you encounter any such behavior while taking part in Battleriff matches, take a screenshot and contact an admin. We reserve all the rights to amend the rules and/or structure of the event at our sole discretion. In the unlikely case of a dispute, we reserve the right to interpret the rules at our sole discretion. Any decisions taken by management in this regard are final.